As a recruiter, I communicate daily with travel candidates and clients. I see a lot of CVs, and put people forward for a lot of interviews. In the current candidate-driven market, let’s look at what is more important to get your foot in the door of a top travel company: experience and a great CV vs a positive attitude. First thing I would say is that if you use a specialist recruitment consultancy you are already at an advantage. I build relationships with both candidates and clients, so that, for example, if a CV doesn’t sell itself, I can help a candidate tweak it, and after I have spoken to them and they’ve convinced me they’d be a good fit, I can recommend them to the right clients. Without me, the client may have skimmed past what looked like an ordinary CV. I know my clients well, and if I believe a candidate has what it takes, I can be confident in my recommendation. My biggest successes are often when clients take a risk and go with a candidate’s positive attitude and drive, rather than their specifically relevant experience or skills. But, again, this does depend on the role. If there is a technical IT role, for example, it may well be impossible for the candidate not to have prior knowledge of the systems involved. Lack of experience doesn’t mean you shouldn’t devise a top-notch CV, however. Experience in previous roles, even if they’re not directly relevant, should be listed in an engaging and fact-driven way. Often, it’s the way you present your experience that matters. Experience and a great CV combined with a positive attitude are the ideal, but use whatever experience you have to highlight why you’d be good at a particular job. Evidence: Employers always look for evidence. Don’t just say you’re great at sales, write evidence of how you smashed your sales targets. Pick out significant achievements within your career, and describe them. Scores of tiny details can obscure more worthwhile achievements. List awards and how they were achieved. Illustrate how you are a team player in specific circumstances. Consistency: As a travel job recruiter, one CV bugbear for me is consistency. If I see that a candidate has moved job every year or two, it immediately makes me question why. It’s my job to dig deeper and find out what the reason is. But in truth, the majority of the time I avoid jumpy CVs, as it indicates someone with itchy feet, whose loyalty and consistency could be a problem. Sell yourself: The CV is your opportunity to show off key skills and experience. It should be a persuasive selling tool, written clearly, accurately and concisely, showing why a company should hire you. Be personal: Some people think personal information on a CV is a waste of time. I disagree. A personal profile that briefly details what you like doing outside of work gives an indication of your character and lifestyle. This can show the employer whether you would be a good cultural fit. If you highlight success in and outside of work – anything from a charity event that you have helped organise, volunteer work, an athletic achievement, or something like a cooking competition – it illustrates what sort of person you are. It’s a way to highlight a positive attitude. Think about how the employer will interpret what you write. Tailor your CV: I always recommend that candidates look at the job spec given and tailor their CV to highlight key skills and successes to match the job. Each time you send out your CV it should be aligned to the job that you’re applying for. When we pass on candidates’ CVs, this helps to highlight why we have submitted these particular candidates. No employer wants to feel like they’re just one in a long list. If employers see someone who has achieved well outside of work, they’re likely to be a disciplined and committed person in general. Obviously, for some jobs, direct experience is non-negotiable. But if the right person isn’t forthcoming, a company may consider hiring a junior with a good attitude to train up. With the investment of time, employers can mould a new employee, through great training programmes, incentives, a positive team around the new employee, and ensuring clear lines of communication. Not all companies are willing to invest, but the best ones do. There is a lack of candidates out there. I am having to make recommendations to clients to help them find suitable candidates. We have our heads in the market every day, and know what is out there and who is good – and I do remember the candidates who have shown a positive attitude, first. I work with a lot of Travel Management Companies (TMCs), and recently I am noticing hires of people outside the TMC circle, which is proving to be a real success. I think it’s advantageous for companies to be more open, otherwise the same talent pool keeps getting recycled. So, try and show that your attitude and experience will make you a good candidate, even if the experience is not directly related to the job you’re applying for. 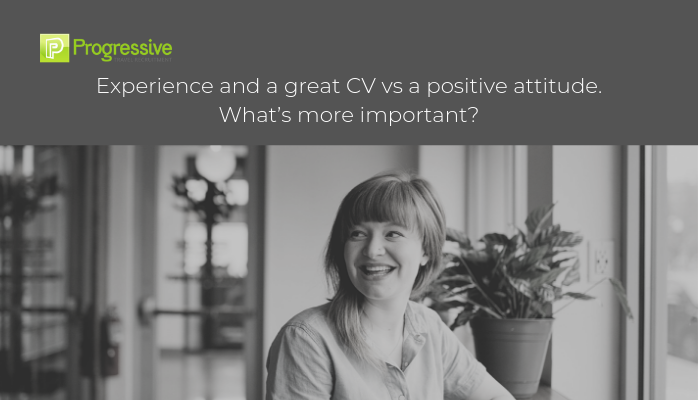 The trick is to make the great CV vs a positive attitude debate redundant, by showing how your experience is relevant, and demonstrating positivity and an aptitude for learning. In conclusion, experience and a great CV vs a positive attitude is a balancing act. A great CV doesn’t have to have reams of direct experience to catch someone’s attention. It should show why you’ve got a positive attitude. I believe that a great attitude is probably the most important thing, as well as evidence on your CV about how roles have helped you develop, and what sort of person you are. However, if you have a jumpy CV, or an aloof manner, these aren’t going to be to your advantage, even if you have a lot of experience. My other key piece of advice is to use a specialist recruitment service. We may get your foot in the door via a personal recommendation more successfully than just sending off your CV. Connect with Nicola on LinkedIn here to help get your foot in the door of your next great travel job.